When transparent soil technology is used to study the displacement of a slope, the internal deformation of the slope can be visualized. We studied the sliding mechanism of the soil-rock slope by using transparent soil technology and considering the influence of the rock mass Barton joint roughness coefficient, angle of the soil mass, angle of the rock mass and soil thickness factors on slope stability. We obtained the deformation characteristics of the soil and rock slope with particle image velocimetry and the laser speckle technique. The test analysis shows that the slope sliding can be divided into three parts: displacements at the top, the middle, and the bottom of the slope; the decrease in the rock mass Barton joint roughness coefficient, and the increase in soil thickness, angles of the rock mass and soil mass lead to larger sliding displacements. Furthermore, we analyzed the different angles between the rock mass and soil thickness. The test result shows that the displacement of slope increases with larger angle of the rock mass. Conclusively, all these results can help to explain the soil-rock interfacial sliding mechanism. 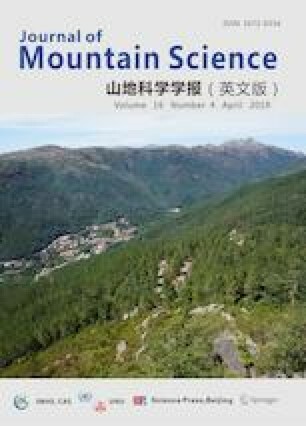 The research was funded by the Scholarship for Visiting Scholars of the Key Laboratory of New Technology for Construction of Cities in Mountain Areas, Chongqing University (Grant No. 0902071812102/011), the Major Project of the Provincial Science Foundation of Inner Mongolia, China (Grant No. 2012ZD0602), Ordos UEGE, China (Grant No. 18-8) and the National Natural Science Foundation of China (Grant No. 51622803).